We have a new hoof boot video page up and running. The page allows you to view sizing, fitting and removal by each product. Take a look at the new page here. Big news! Pete Ramey's Under the Horse DVD series gets a very important review from the American Farriers Journal. The barefoot concept is definitely not a fad but a concept accepted by even the brightest thinkers in the horse industry. "Pete Ramey’s set of DVD’s is without a doubt a must-have series for any equine professional farrier or horse owner. While he is an advocate of barefoot trimming, there are many ideas that you can learn from this package regardless of how you trim and shoe horses. 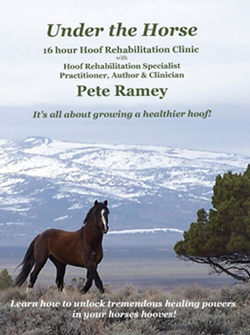 In these 10 DVD’s, Pete Ramey spends 16 hours covering topics ranging from basic anatomy, biomechanics, nutrition, laminitis, navicular issues and problem feet. All are discussed in a clear, no-nonsense approach. This series is filled with detailed information that all equine professionals can use. Everything is explained in such a way that everyone can benefit from Ramey’s knowledge and learn new ways to unlock tremendous healing powers from the horse’s hooves. It focuses on the ability to demonstrate the steps that are needed to drive a pathological hoof toward a healthier state. A combination of contemporary veterinary research and practical real-world field work will help viewers arrive at sound protocols that can be put to immediate use with any horse. In 9 hours of classroom instruction, you’ll learn about the mechanics of trimming and how to effectively bring positive changes to the hoof over time. You’ll also develop a deep understanding of the internal hoof structure and see how it impacts a horse’s performance. Following the lecture portion, you’ll view 7 hours of trimming on live horses suffering from a wide range of hoof concerns. This includes assorted breeds, a foundered mule and a draft horse. Finally, the DVD walks you step-by-step through an emergency call with a laminitic horse suffering from a 20-degree rotation. You’ll evaluate the trimming and progress during a number of visits with this laminitic horse. Pete Ramey offers wisdom and insight that his years of practice and study have given him. If you own only one shoeing DVD series, this should be it." EasyCare and EasyCare Downunder recently helped cover the travel costs of Professor Robert Bowker to Australia. While in Australia Dr. Bowker helped educate a group of equine podiotherapists. Learn more about the event here. Future Australian Equine Podiotherapists – Class of 2008. Front Row: Jeane Dekter, Marie Farr, Rebecca Scott, Professor Robert Bowker (lecturer), Yvonne Taylor, Mike Ware (lecturer), Adrianna Della Franca, Andrew Bowe (lecturer). EasyCare will soon be selling the "Under The Horse" DVD series produced by Pete and Ivy Ramey. The 10 disc DVD set is filled with information and an incredible bargain at $250.00. "This video is designed to teach equine professionals and horse owners new ways to recognize and treat hoof pathology. It focuses on the ability to identify and recognize a truly healthy equine foot and demonstrates steps taken to drive a pathological hoof towards a healthier state. The combination of contemporary veterinary research with practical, real-world field work presented will enable viewers to arrive at sound, valuable protocols that can be used immediately to benefit the horse." Check our online store next week to order your DVD. The concept of keeping horses barefoot has gained a great deal of acceptance over the past 5 years but I believe the main thing that will limit continued growth is the lack of qualified, knowledgeable hoof care practitioners. Many people would like to keep their horses barefoot and work with a local practitioner but there are simply not enough practitioners. I have access to a very good practitioner in Tucson Arizona. She has taken several courses in different trimming and natural hoof care techniques, is dependable and is also knowledgeable about what is happening in the industry. We are lucky to have her. I currently have my horses in Durango Colorado for the summer months while I concentrate on the research and development of two new hoof boot designs. Before coming to Durango I sent out several e-mails looking for a good practitioner in my area. I couldn't find anyone for several hundred miles. I was both disappointed and a little concerned for the future of barefoot. Although I would prefer to have the best trimmer possible take care of my horses, I do have the ability to keep my horses feet in pretty good shape. I have personally attended two Pete Ramey Clinics and did a one on one trimming day with Jaime Jackson. I have all the tools and stands but still prefer to have someone trim my horses who spends more time under a horse. EasyCare has decided to help alleviate the "lack of practitioner" problem by offering scholarship money to practitioner courses. We have finalized a scholarship program with The Equine Sciences Academy and hope to partner with the other practitioner courses in the near future.